His mom, biologist Rachel Fitchett, made a correlation between Aiden’s headaches and the circumstances: wireless fidelity waves or WiFi, which has been associated with causing physical effects in a small percentage of the population. “I knew the health risks associated with WiFi and asked the teacher to relocate him and the headaches stopped,” Rachel says. While that was great, the situation still puzzled Aiden’s inquisitive mind. So when Science Fair time rolled around he knew exactly what he wanted to delve into. The other tray was placed six inches from a WiFi router in a neighbor’s home which was turned on the whole time as well. “At first Aiden was excited as the seeds started to grow, but by the second to the last day one of his notations on the WiFi sprouts was ‘strange,'” Rachel says. In the Danish experiment, the cress seeds placed near the WiFi device did not sprout at all. While Aiden’s WiFi seeds sprouted, they did not look anything like the robust sprouts growing in the wired room. Aiden’s mom tends to agree—although in more scientific terms. “The more that are together, the more concentrated the ill effects are,” she says. Aiden’s headaches continued during computer class, so he has since been pulled. This entry was posted in Smart Meter and tagged Electromagnetic hypersensitivity, headaches, Wi-Fi, Wireless. Bookmark the permalink. This article should be sent to every school using wi-fi devices and parents should be able to sign a non consent form for classroom wireless emissions. Long term effects are not known – why risk it? Because the government says it is safe? Maybe Aiden can teach them a few things, I know who I would believe. My kids are informed on this subject, but unfortunately many are not. Aiden is a brave an intelligent boy. 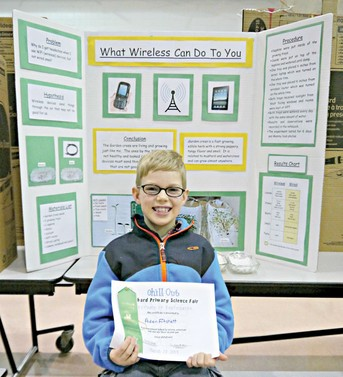 With this attitude and with the knowledge he has now acquired on the need to protect himself from wireless radiation and on how to make the best of technology in a safer way, he will surely have a bright future. This should be the case for all children, but sadly, it’s not. Our children are taught at school that being immersed in Wi-Fi all day is the norm and that it is what their teachers and principals expect of them. They are not taught to question the safety of Wi-Fi or the need for it. What kind of future will they have? And who is responsible? So a child can work it out, but our glorious leaders can’t. That’s the size of it. “The so-called Glorious leaders can’t work it out you say.” That’s simply because they are blinded by the money they are all making out of Wi-Fi and these now proving to be not so smart Microwave and far from Smart Meters which are now proving to be Type 2B Carcinogen Meters world-wide. Those who support all of this Wi-Fi FILTH and the Microwave Smart Meters ( read here, not so smart meters are corrupt and or getting paid by this Microwave Industry who are paid to LIE so that they can keep their stinking poisonous to all life dopy jobs. They don’t want to mate while they are reaping lots of money making us sick. I sympathise with Aiden and his headaches around wifi. I too was getting more and more headaches that were lasting up to 3 days a time. I had no idea what caused them as I am otherwise pretty healthy. Then I was listening to fairdinkumradio.com to an interview with a New Zealand chap who had a company called Blueshield that purported to have gadgets that protected the body from electromagnetic radiation from wi-fis, smart meters etc. My household uses wifi so I bought a plug in and a battery operated gadget (the latter for protection when you are out the house and swimming in these waves in town etc). My headaches ended as soon as I started using these gadgets so that made it clear to me that the wifi was the culprit (no microwave towers nor mobile phone service where I live). I wonder what other harm this radiation causes longer term – cancer is the biggest concern. Google “Barrie Trower” for a rude awakening of the dangers of wifi for schoolgirls in particular. The Microwave Radio business here in Victoria Australia and world-wide is rotten to the core, including those who support this stinking business which embraces the so-called Smart Meters which are now proving to be Type 2B Carcinogen Causing Machines not only here in Victoria Australia but now in Western Australia and in other States in Australia where many people have been conned into allowing this FILTHY Microwave poisoning radio-waves to constantly flood through their bodies often at very close quarters such as a Health Wrecking dopy Microwave Meter right outside their bedroom wall and often as close as up to three feet from their heads. No wonder a fast growing number of these people who have been conned into accepting these Devilish Machines are so adversely affected with problems such as splitting headaches and or Tinnitus = ringing in the ears and or bleeding noses and or burning sensations behind the eyes and other diseases so soon after these wicked and health wrecking and truly far from smart meters are fitted after the customer/s Safe and Passive Analog Electric Meter has been stolen or more often than not coerced by Lying Smart Meter Installer Men. In every case by the LYING C.E.O’s of the foreign owned electric Power Companies of Powercor and Citypower and Jemena and United Energy Distribution and SP AusNet and their so-called Public Relations or Publicity Officers have sent out LYING letter to their Electricity Customers here in Victoria stating that; ” It’s THE LAW that one has to give up one’s Analog Electric Meter and take the Electric Microwave Smart Meter. “Smart Meter” It’s NOT THE LAW that one has to accept a Microwave and truly far from Smart Electric Microwave Meter ! There is nothing SMART about a Microwave Electric Meter or now renamed A.M.I Meter= Advanced Metering Infrastructure Meter, which is the same thing as a Microwave and truly far from SMART METER. The name change has been used simply to Hood-Wink many of the unsuspecting people, many of whom are too disinterested to look into this Gigantic and Unlawful and Poisonous Confidence TRICK still being used against the Victorian Public and other Australians in now all States of Australia. Now I have received a number of complaint from Western Australia about this Gigantic Confidence Trick of the so-called but far from Smart Meters. If you have had a Microwave Smart Meter installed against your will and better judgement, write to the C.E.O of the Electric Power Company for your area and DEMAND that they replace it with the Safe and Passive Analog Meter immediately which they stole or coerced from you. If that C.E.O responds in the negative, that is to refuse to accede to your Lawful Demands, then see a good lawyer and get that lawyer to send that C.E.O a Lawyer’s Letter demanding the change over to the Safe and Passive Analog Meter or your Lawyer will Personally Sue that C.E.O by dragging him into Court. If you are suffering ongoing Medical problems from the effect of the Poisonous Microwave and far from Smart Meter, for example, Tinnitus = ringing in the ears or a bleeding nose or Chronic Sleeplessness, or Tachycardia and Arrhythmia etc. after the installation of a Microwave Smart Meter, get your lawyer to Sue for the cost of any medicines you have had to procure from your Pharmacist and or any Hospital Bills. Keep all of these original bill to show to your Lawyer and get him to include copies of these bills to be paid by the C.E.O, which are to be added to your Lawyer’s Letter’s of demand on that C.E.O in the Lawyers Letter. Hopefully that will get results. for further information regarding Wi-Fi in schools. Also please visit: http://www.wifi-in-schools-australia.org/ website. Lots of interesting reading here. Safety Code 6. What is mentioned in this video applies every little bit to us here in Australia.